Translate of frailty-specific information between care providers and across a spectrum of care settings. Provide a platform to design, evaluate and implement further interventions specifically targeting vulnerable and frail patients. The Clinical Frailty Scale (CFS) is a nine-point clinician judgment-based tool that provides a simple, reproducible measure of frailty. In the ICU setting a score would be assigned by the admitting physician and would be based on the patient’s condition prior to the event that brought them to the ICU. For this study, the CFS has been added to eCritical as part of the Physician Admission Form. 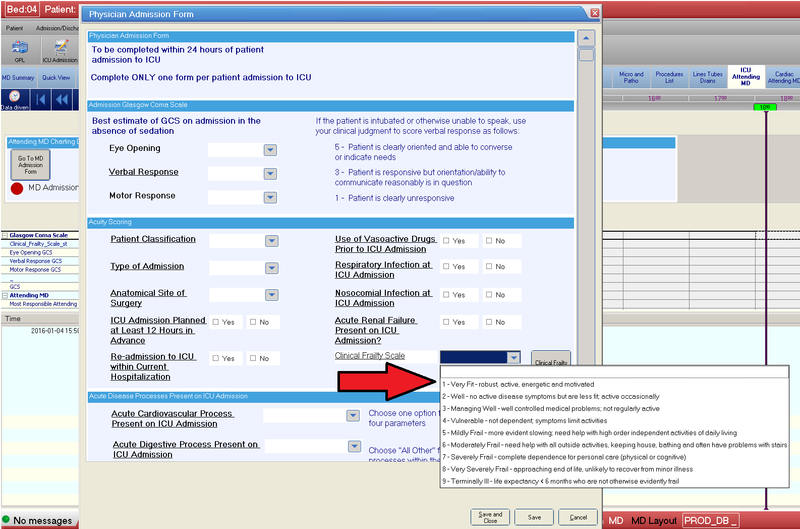 The CFS score can be accessed by a drop down tab on the “acuity scoring” menu. A more detailed visual analogue scale defining each score on the CFS can be accessed by the “Clinical Frailty Scale” button to the right of the drop down tab. The assigned frailty score is then integrated into the inter-professional EMR charting (RN, physiotherapy, occupational therapy). A prospective multicenter cohort study of frailty in younger critically ill patients. Bagshaw M1, Majumdar SR2, Rolfson DB3, Ibrahim Q4, McDermid RC5, Stelfox HT6. Crit Care. 2016 Jun 6;20(1):175. doi: 10.1186/s13054-016-1338-x. The CFS is a nine-point physician judgment-based tool that provides a simple reproducible measure of frailty. The CFS has been added to the Physician Admission Form and can be accessed through a drop down menu under the Acuity Scoring menu. A more detailed visual analogue scale defining each score on the CFS can be accessed by the ‘Clinical Frailty Scale' button to the right of the drop down tab. Physiotherapy and occupational therapy charting. This study is funded by the Canadian Frailty Network. Frailty is a multi-dimensional syndrome characterized by the loss of physiologic and cognitive reserves that can put an individual at a higher risk of developing poor health outcomes. Ultimately, frailty contributes to poor quality-of- life and dependence on others to carry out day to day functions. A recent Alberta study showed that frailty is common among critically ill adults aged 50 years or older. Compared to those who were not frail, frail patients admitted to ICU were more likely to die in hospital, acquire new disabilities, become functionally dependent, have poorer quality of life and more often required hospital readmission. These study results indicate that frail patients respond differently when developing critical illness compared to patients who are not frail.